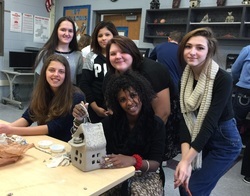 Ceramics Club promotes art through various three dimensional art projects. Join us if you would like to have fun after school and express your creative side! You do not need to be an amazing artist or enrolled in an art class to be part of Ceramics Club. As long as you enjoy creative activities and have a positive attitude you are welcome to join! Ceramics Club meets ​every Friday after school for one hour in Mrs. Warner's room - 169.